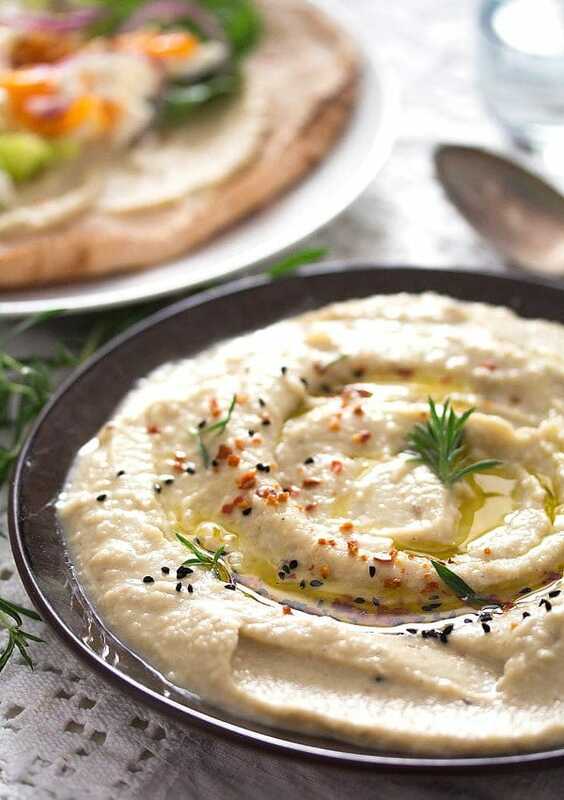 A smooth vegan bean dip or spread made with dried fava beans, cumin and garlic, a healthy and delicious Egyptian recipe. As mentioned in the previous posts (Danish Open Faced Sandwiches or Peri Peri Chicken), I am currently in the middle of a series on Where Is My Spoon, trying to cook as many dishes as the time allows from countries participating in the FIFA World Cup. I have already cooked some Danish and Portuguese food, some Saudi Arabian shawarma, some Russian chicken fritters and so on. Egypt is on my list as well. Well, Egypt has been and is in many in of my lists during my life: the countries I would most like to visit, most interesting history ever (I used to rather read about Egypt’s history or watch documentaries about it during my teenage years than go out…), food lists, I used to have pen palls in Egypt, I collected books and small objects, well, let’s say I had a major Egypt obsession as a teenager. 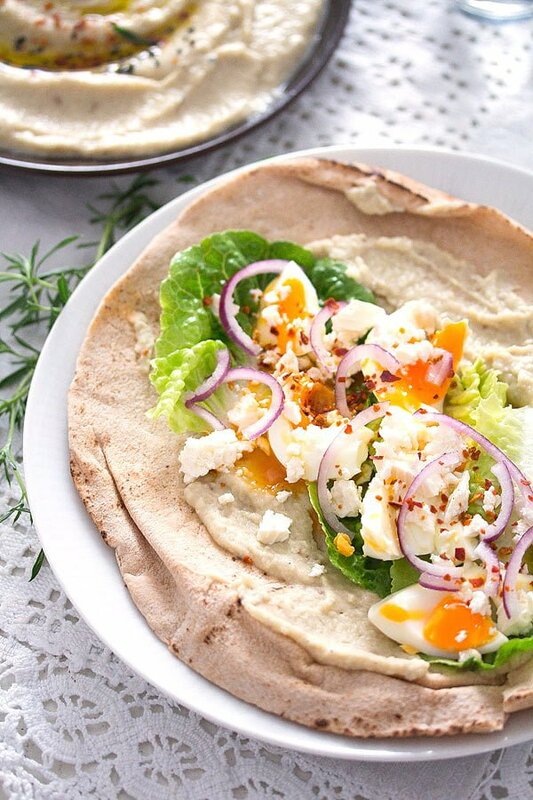 So, when I started cooking these “football” recipes, Egypt was at the top of my list. I had actually intended to make fuul mudammas, a famous Egyptian breakfast dish consisting of cooked fava beans and spices. But… something went a bit wrong, so that I don’t actually dare calling today’s Fava Bean Dip or Puree with Cumin a fuul mudammas. 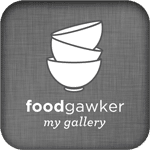 You see, when making a recipe for the first time, it is my habit to search online or in my hundreds of cookbooks and read as many versions of one recipe as I have time or patience. When starting to read about fuul mudammas, I actually came across another recipe for Taameya – Egyptian Falafel made with dried fava beans (which I definitely have to try soon as well). So, although reading about 15 other recipes for fuul mudammas afterward and seeing countless pictures of fuul mudammas, I still did not realize anymore that a fuul is a stew and not a dip or spread, it is not supposed to be smooth… The picture of that smooth spread was so imprinted on my mind, I did not want to see anything else. 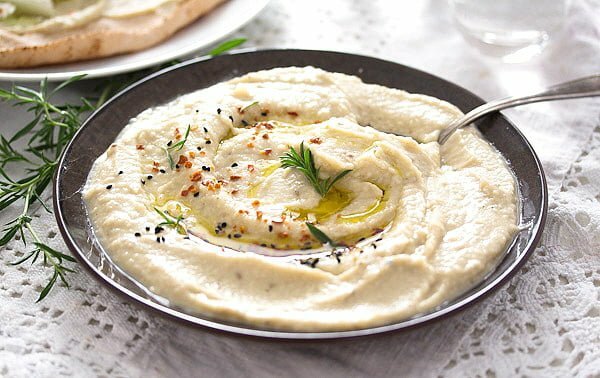 As a result, I cooked my fava beans, pureed them properly with cumin and lemon juice, was so amazed about how good the fava bean dip or spread was, kept eating it for 5 days in a row for breakfast and dinner and when checking again, I realized that I didn’t cook a fuul mudammas, but just a fava bean spread similar to a chickpea hummus, but so delicious that I know I will make this on a regular basis from now on. 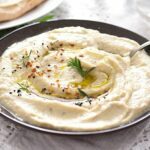 The recipe for this Fava Bean Dip or Puree with Cumin is very simple, give the very few ingredients to the food processor and puree until smooth, nothing more and nothing less, there is really no need for specific how-to instructions or anything. But, there is still one thing I have learned in the process and that is how to cook dried fava beans. I have eaten fava beans before, a friend of mine got the recipe for a fava bean and zucchini spread from a Syrian friend of hers. I liked that very much, but although having seen dried fava beans in the Turkish store, I was never very much tempted to buy them. They are huge things and I knew that I would have to remove that skin, if I ever want to make anything with them. But this time, I thought I would do it, if it only was for one time. So, I bought the beans, soaked them overnight and spent one and a half hours the next morning peeling those fava beans. The resulting Fava Bean Dip or Puree with Cumin was so well worth it, but to tell you the truth, I don’t think I will buy those dried fava beans anytime soon. The positive part of it is that there were so many beans (a 1 kg bag), that now I still have enough peeled and cooked fava beans in my freezer to make the Fava Bean Dip or Puree with Cumin at least two more times. But I have drifted away again. Back to the way of cooking the dried fava beans. 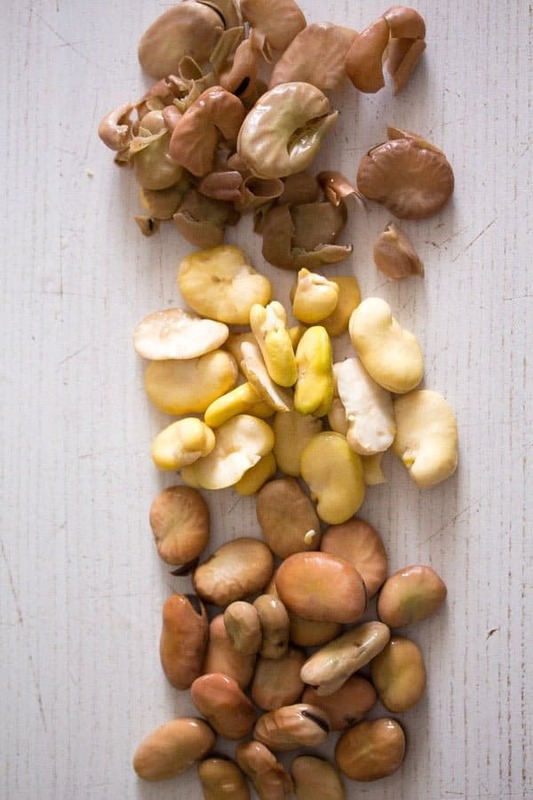 There are two types of dried fava beans: the large ones and the small ones. Bellow are the instructions for cooking large dried fava beans. Step 1: Give the fava beans to a very large bowl. Cover with plenty of water, stir in 1 tablespoon baking soda (tip from my Syrian friend, Nesrin) and leave to soak overnight. Make sure there is enough water in the bowl, the fava beans will swell a lot. Step 2: Drain the fava beans and peel them. Peeling 1 kg of fava beans took me about one and a half hours, so make sure you have that time. Peeling the beans is time consuming but it is very easy, you will have no difficulties in removing the skin. When peeling the beans I discovered that a few of them had little holes inside and things in the holes that looked like dried and rehydrated tiny worms. 🙁 I am not sure what those were as this was my first time with fava beans, but I discarded those beans. Another reason for me to buy the canned fava beans or the split ones next time, I would say. Step 3: Cook the fava beans in plenty of fresh water. Cover them with water, bring to a boil and simmer for up to 40-45 minutes. Make sure you already check after 25-30 minutes, you want the fava beans to be tender and properly cooked, but they should not get mushy. Keep checking every 5 minutes or so. Step 4: Drain well, let cool a little and proceed with the recipe for Fava Bean Dip or Puree with Cumin. If you cooked a whole bag of fava beans, you can freeze the cooked beans and use them later on. 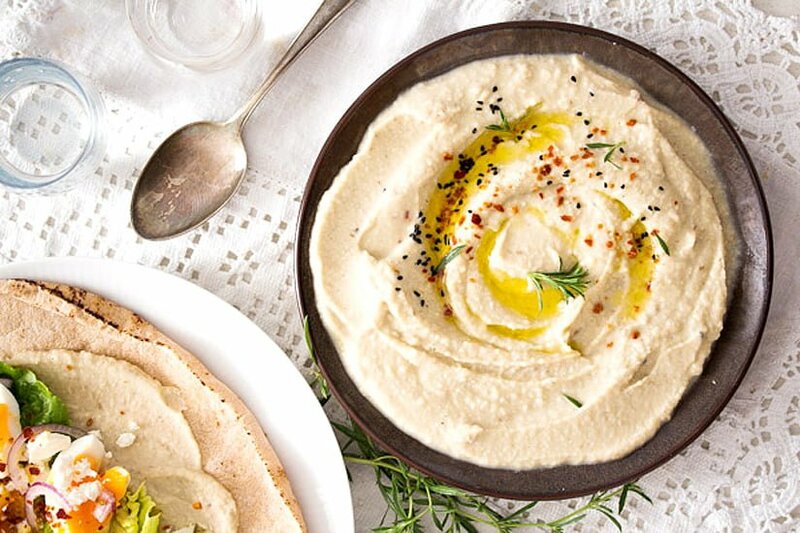 Serve the Fava Bean Dip or Puree with Cumin as a dip for vegetables, as a spread on bread or crisp bread, as a filling for pita bread or flatbread with other toppings like waxy cooked eggs, feta cheese and red onions, cooked chicken Shawarma style, baked vegetables, falafel or other vegetarian patties or balls. To cook your own dried fava beans start by soaking them overnight in plenty of water. Drain the beans, give them to a large pot and cover them with plenty of fresh water. Add the baking soda, bring to a boil, turn the heat down and simmer the beans for 30 to 45 minutes. Start checking after 30 minutes already, the fava beans should be tender but not mushy. If they are not done yet, keep checking every 5 minutes. Drain the beans and reserve some of the water for the Fava Bean Dip or Puree with Cumin. If you use already cooked beans, you can use plain water for the dip. Reserve the required fava bean quantity for this recipe. You can use the remaining beans for something else or you can freeze them for later use. Chop the onion very finely. Heat 1 tablespoon olive oil and cook the onion for about 3-5 minutes until soft. Stir often. Add the grated garlic cloves and the cumin seeds and cook, stirring constantly, for another minute. Give the cooked fava beans to a food processor. Add the onion mixture, about ¾ of the cooking water or plain water, lemon juice, olive oil and some salt and pepper. Process until very smooth, stopping the food processor a few times in between and scraping its walls properly. Adjust the consistency with some of the remaining water, if necessary. Add more salt, pepper and lemon juice to taste. You will need about 200 g/ 7 oz dried fava beans to get 450 g/ 1 lb cooked fava beans, a bit more or less is not so important in this recipe. 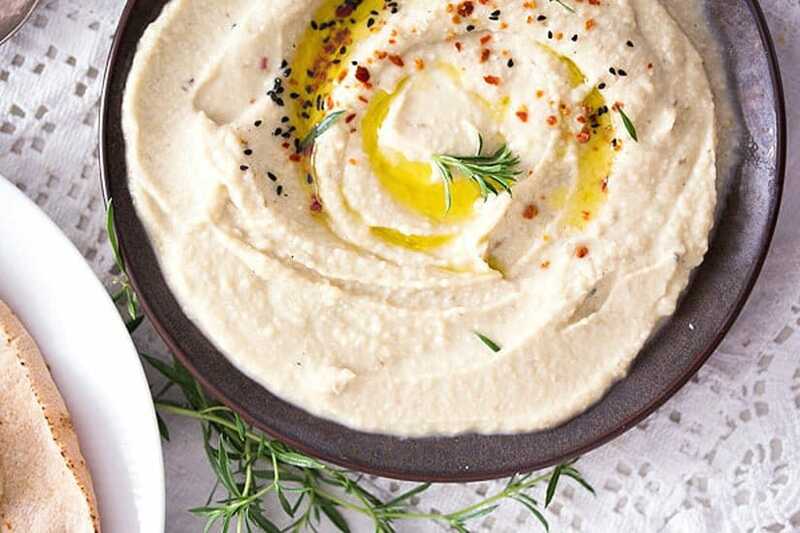 If you cook your own dried fava beans, you will need one tablespoon of baking soda as well. You will have to take that away from me, or I would finish the whole bowl at one go! 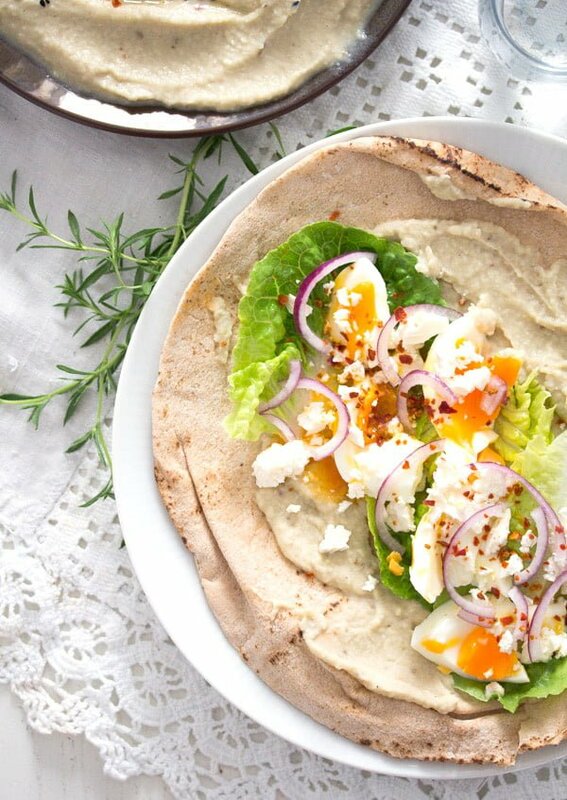 It’s a fantastic change from the chickpea hummous! (By the way, I’ve just made some hummous today…..funny coincidence).